INTRODUCTION: Bronchscopy and laryngoscopy have become common bedside procedures in the ICU. Frequently, however, these modalities utilize non-video platforms which make it difficult for novices to perform the procedures independently. This study evaluated a novel ICU bedside procedure cart for performing video laryngoscopy and bronchoscopy to see if junior level residents could be mentored through these cases independent of attending take-over. 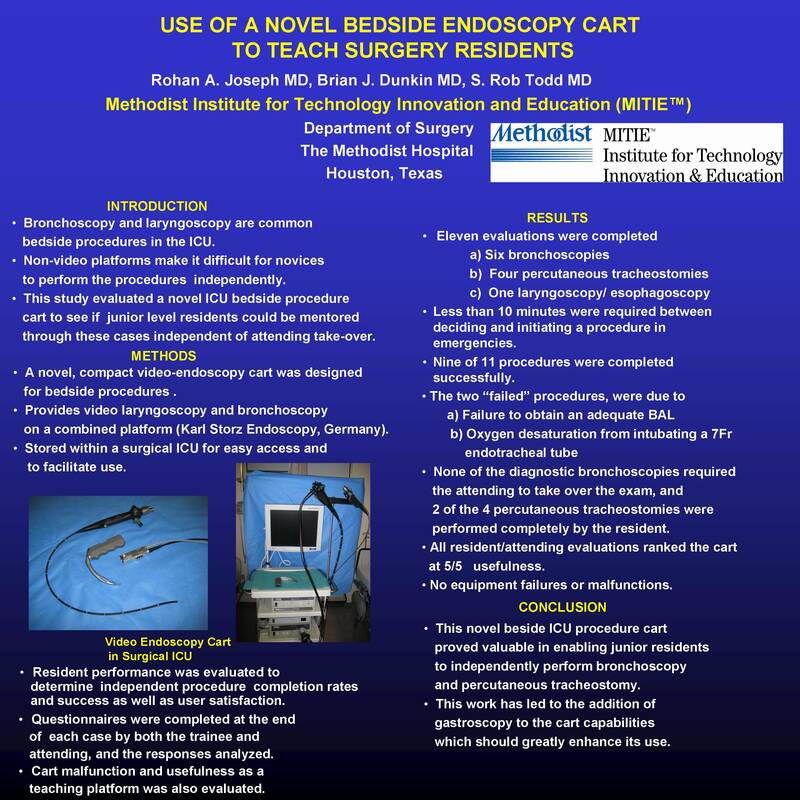 METHODS: A novel, compact video-endoscopy cart designed for bedside procedures was developed. This cart provides video larynogscopy and bronchoscopy on a combined platform (Karl Storz Endoscopy, Germany). The cart was stored within a surgical ICU in order to foster easy access and to facilitate use. The performance of residents in bedside endoscopy was evaluated to determine independent procedure completion rates and success as well as user satisfaction. Questionnaires were completed at the end of each case by both the trainee and attending and the responses analyzed. Cart malfunction and usefulness as a teaching platform was also evaluated. RESULTS: Eleven evaluations were completed for six bronchoscopies, four percutaneous tracheostomies, and one laryngoscopy/esophagoscopy using the bronchoscope. All procedures were performed by second and third year surgery residents. When an emergent procedure was indicated, less than 10 minutes were required between deciding to do the procedure and initiating it. Nine of 11 procedures were completed successfully. The two “failed” procedures were not user or device related and, in fact, were due to failure to obtain an adequate broncho-alveolar lavage and oxygen desaturation from intubating a small 7Fr endotracheal tube. None of the diagnostic bronchoscopies required the attending to take over the exam, and 2 of the 4 percutaneous tracheostomies were performed completely by the resident. All resident/attending evaluations ranked the cart at 5/5 usefulness. There were no equipment failures or malfunctions. CONCLUSION: This novel beside ICU procedure cart proved valuable to attending and resident surgeons alike in enabling junior residents to independently perform bronchoscopy and percutaneous tracheostomy. This work has led to the addition of gastroscopy to the cart capabilities which should greatly enhance its use.